A few months ago, I recieved an inquiry from an individual interested in the preservation of a historic house in her neighborhood. I drove by it, and saw a house with good proportions and what seemed like excellent potential. 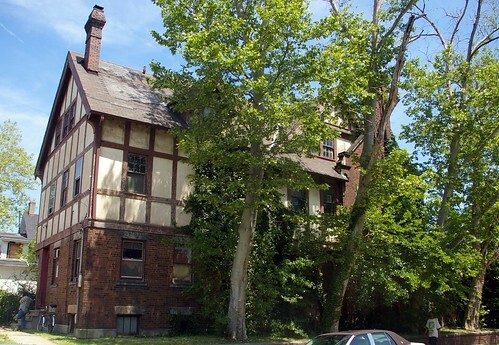 The 4,000+ square foot house, at 12921 Euclid Avenue, in East Cleveland, is one of many massive homes still standing in an area that was known for expensive houses, including the estate of John D. Rockefeller. Many of the houses that lined Euclid Avenue in East Cleveland are long gone, as residential uses have made way for commercial ones. You would be surprised, I suspect, if you were to head south off Euclid Avenue, between Superior and Lake View Cemetery - you'd find block after block of beautiful turn of the century homes. 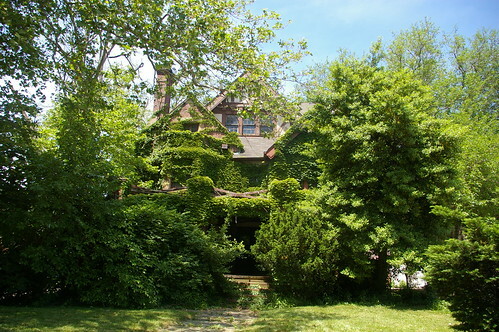 This house, built in 1903, was designed by architect William R. Watterson for John T. Gill. (Plain Dealer, April 5, 1903, page 20) The Gill family, as John Gill and Sons, built some of the most important structures in Cleveland in the late 19th and early 20th centuries, including the Terminal Tower. The Gill family moved out of the house in 1915, after which time it passed through several owners, apparently with at least part of it being rented out at that time. Through the 1930s, 1940s, and 1950s, it was the site of several different funeral homes. It was site of the Gestalt Institute of Cleveland from 1973-1978, which then sold it to the East Cleveland Bible Institute. 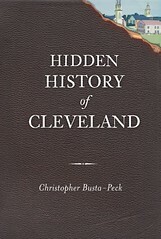 In 1988, it was transferred to the East Cleveland Board of Education. A tour of the property revealed a house that I believe can be saved. The exterior is covered with vines right now, but they could be removed easily enough. This, I believe, may be one of the greatest difficulties with marketing the structure as it is right now - quite simply, it's difficult to visualize what this house might again look like. From the side, we can see better assess what work might be needed. The roof will require significant repair. The trim needs to be painted, too, but it should be relatively easy to scrape and prepare, as it is almost entirely flat, rectangular boards. Other than that, there aren't any obvious problems seen here. There isn't any evidence of settling or foundation problems. There's some obvious water staining here, on the other side of the house, due to a missing downspout. There's also some rather nice architectural detail. The house is based on a wide central hallway running from front to back. Two staircases, one and the front and the other at the rear, branch off to the side. The entry, seen here, consists of a beautiful double door (alas, I don't have a good picture), an airlock, and then this door. On one side, facing the street, is a living room. 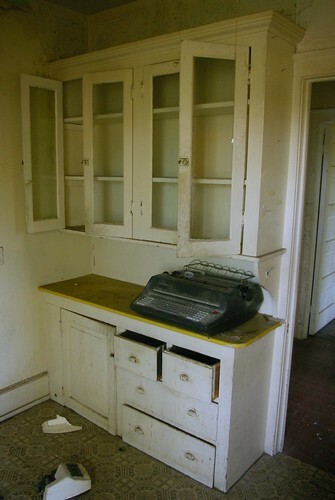 It features beautiful wood trim, some of which has been removed. A vine has made its way in through the window, a common theme, and which seems to have likely occurred this year. The windows throughout the house seem to be in good condition and like they will be able to be retained with minimal work - it's just that vines can get in through the smallest spaces. There's corresponding water damage on the second floor - presumably from the same source. Most of the rest of the first floor appeared in reasonably sound, if architecturally undistinguished, condition. These stairs lead to the second floor. 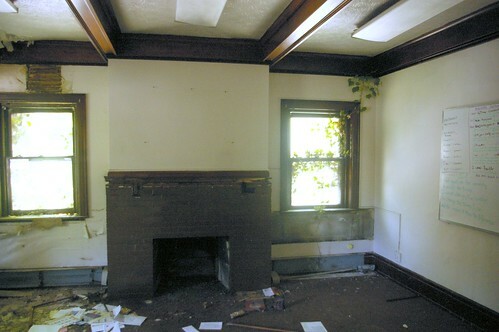 A room with wood paneling is visible in the background. Some of the railing is missing, but the shape of the staircase as a whole still has a considerable amount of visual appeal. 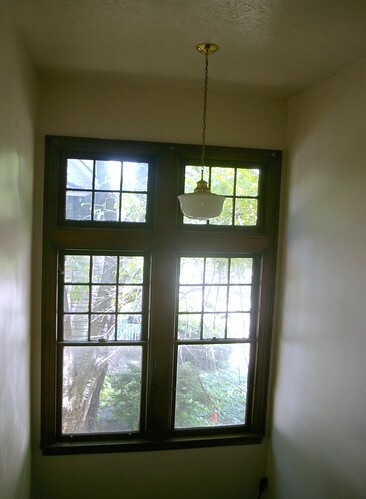 The stairway is illuminated by this massive window, which fills the space with light. Some parts of the railing remain, tossed aside. 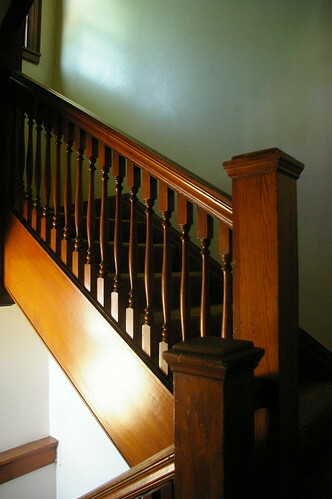 One option to consider would be to use the remaining railing and spindles from the rear stairs to rebuild the front stairs, thus keeping some visual consistency. Indeed, this might even be a reasonable course of action throughout the whole house. Most of the wood trim is still present, and of that, most of it remains unpainted. If you've looked at old houses much, you know how rare this is. There's walnut crown moulding. 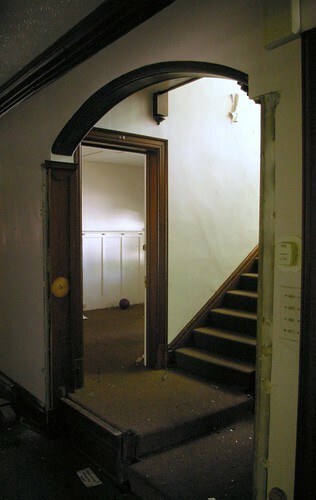 There are several spots where doorways were reduced to single width. I suspect that several of these may have been pocket doors, and that the pocket doors may still remain, encapsulated in the walls. The second floor has a similar set of assets and liabilities to the first. 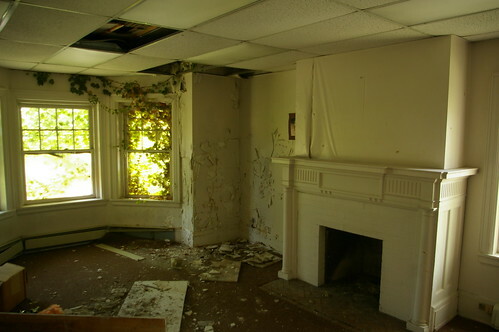 Most of the rooms are reasonably clean, but again, there is the problem with vines. The third floor is quite spacious. While I didn't measure it, I would guess that the ceilings are 8' high. The kitchen for the servants is shown here. On the third floor, we can also see the two places where water is leaking in. The basement presented a challenge: water. While the plumbing was said to have been shut off, I could hear water spraying from somewhere. I was told that it would be addressed. The full set of photos of the house can be found on my Flickr account. This house could be saved. It appears to be a good, solid shell. The lack of plumbing doesn't bother me. 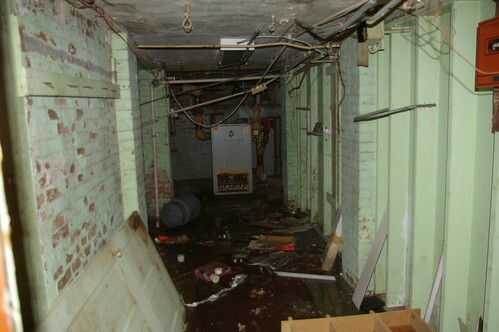 My house has mostly original plumbing, and I can't say that it's much of an asset. (Original bathrooms or kitchens, which have actual aesthetic merit - that's another matter altogether.) But the plumbing itself, I expect to have to rip it all out and replace it. Thanks to the layout of this house, the routes of the plumbing would be pretty much straight up and down - I can't recall a place where you'd be routing pipes over a ceiling. Wiring might be a bit more of a challenge. Unlike most old houses, you'd be sure of the quality of the mechanicals, so that you could worry instead about other things. The roof is the other major problem that I see. A new roof is needed. Period. Fix the mechanicals and the roof, and you've got a interesting house that you could go any number of ways with. Take your measurements, borrow a pickup truck and a trailer, drive up to Buffalo ReUse and pick up the materials to move forward on this project. I believe, with a heck of a lot of labor (as is the case with all old houses) that this could be a really nice house. I even think that it could be done on a budget that could be reasonably justified. The problem is the initial cost. This is where we get to real issues - issues that aren't just specific to this house. The inclination of the School Board is to demolish the property - it's seen as the most cost-effective way to be rid of this liability - but they are willing to look at proposals from individuals interested in fixing it up. The School Board can give the building to a non-profit, but they can't sell it to a private individual for less than the value of the land - estimated at $10,000. Left as it is, they estimate that it will cost $10,000 to demolish the house. I suspect that number is low, given that I've heard figures of $8,000 or $9,000 for houses half the size. Let's say, for the purposes of this discussion, that it will cost $15,000 to demolish this house. $15,000 to get a lot that will be worth $10,000, when it can eventually can be sold. Until that time, they'll still have to pay to keep it mowed and free of trash. Why not, instead, give the interested renovator $5,000 that he or she could put into the renovation of the property? The current laws don't allow for this, but it merits consideration. The same dilemma exists with abandoned houses. 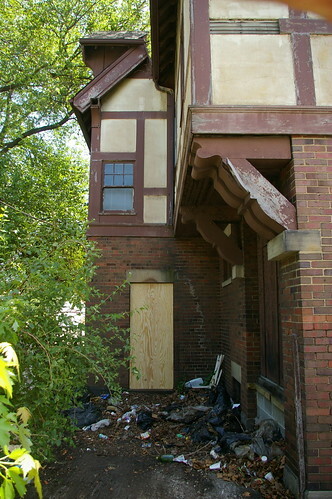 The City of Cleveland spends about $8,000 to demolish and clear a house and then offers the lot for sale for next to nothing. 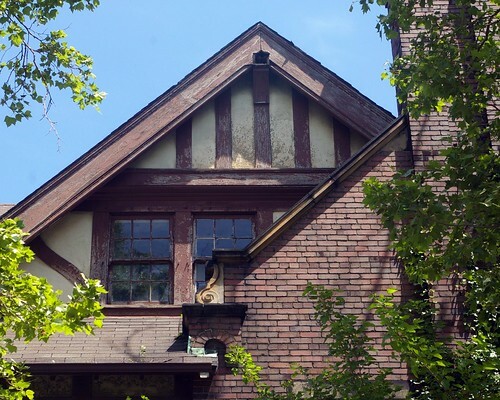 Why not instead make the properties available to people interested in rehabbing old houses, and give them the estimated cost of the demolition to help get the houses back up to livable standards? This would serve to get people living on these sites sooner and providing tax revenue again. Some of the houses being demolished are definitely too far gone to be fixed up - I'm not suggesting that they all can or should be saved. 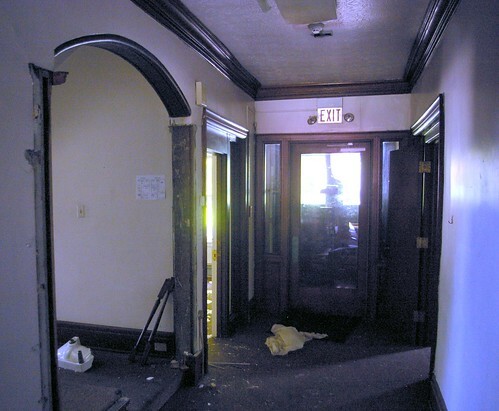 The Cuyahoga County Lanbank offers a good first step - getting some sort of photographic documentation out there of the actual properties in quesion. However, we need more information. It wouldn't take much expense - an hour, perhaps, by a single staffer with a camera, to document the condition of the house, inside and out. This would allow potential homeowners to decide whether or not the project was reasonable. If we are to pay rehabbers to take houses that would otherwise be demolished, how do we choose the right ones? How do we avoid giving away money to people who are just going to spend the money elsewhere and leave us with a house that we'll be faced with demolishing again in five or ten years? Further, how do we make these judgement calls without setting up a massive system that costs more than it saves? It's a difficult question. I'd suggest that, like banks with mortgages, we give some preference to owner-occupants, but beyond that, I have no idea. It's not just about this house or that house. It's about preserving neighborhoods and spending our taxes in the most effective manner possible. I've started working on the getting the ivy off, and some fire fighters have offered some assistance there and with other exterior work. The day the Cleveland Restoration Society came out, the water department wanted to read the meter, and apparently came back to turn the water off, so that's a little progress. I doubt that there would legally be a way for the school district to give anyone money to start work, though there may be insurance money for working on the roof, and I'd look for Historic Preservation Tax Credit money to start work. I've lost faith in the county landbank's will to preserve after recent experiences in the neighborhood, though there might be some hope. As I understand it, the HP Tax Credit program applies only to commercial property listed on the National Register for Historic Places. Further, it is a tax credit, not cash in hand, and is awarded only after completion of a National Park Service, pre-approved, course of action. I've been told that a business can get a tax credit and the money go for a historic building, but not necessarily one on the National Register. I'm not 100% sure of the accuracy of that information, but it was given to me regarding another East Cleveland building NOT on the Historic Register. This house has been torn down! It was strage not seeing there when I was riding down Euclid the other day. I always thought it was one of the most beatiful homes in East Cleveland. It's too bad it couldn't have been saved, it surely was one of a kind. So very sad, just as with many of the spectacular, glorious homes of Cleveland’s Euclid Avenue, they’re just a ghost of a memory now.